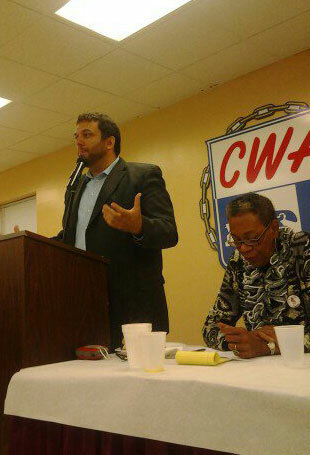 ST. LOUIS – Over 120 union leaders, community, student, faith, and LGBT activists, attended the 21st Annual Hershel Walker ‘Peace & Justice’ Awards Breakfast here on May 4 at the Communications Workers’ Union of America (CWA) Local 6300 union hall. They came to celebrate the work of St. Louis area activists who have gone above and beyond the call of duty in the struggle for social and economic justice, and to hear metro-Detroit AFL-CIO central labor council president, Chris Michalakis, talk about the impact of so-called ‘Right-to-Work’ legislation in Michigan and what we can expect if RTW passes the republican controlled legislature here. 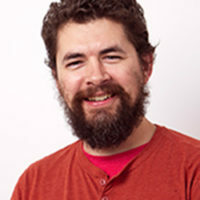 Michalakis attacked the influence of money in politics, especially in the Republican Party, and highlighted the role of its far-right corporate funders in forcing ‘Right-to-Work’ onto Michigan workers. The Missouri legislature is currently debating so-called ‘Right-to-Work’ legislation, paycheck deception and attacks on prevailing wage laws. Fortunately, Missouri Governor, Jay Nixon, has vowed to veto these and other anti-worker bills if they make it to his desk. Missouri union leaders are optimistic that they can convince enough Republican legislatures, with enough phone calls, emails, and face-to-face in district meetings, to distance themselves from RTW, thereby keeping the far-right of the Republican Party from getting a veto proof majority capable of overriding the Governor’s veto. Michigan Governor, Rick Snyder, signed RTW legislation into law last fall. “Where do we go from here,” Michalakis asked the assembled union leaders and community activists? While no-one wants so-called ‘Right-to-Work’ to pass here in the Show-me-State, a number of unions here – primarily public sector unions – already work under RTW-like conditions and in some shops have 80 percent union recognition. Michalakis also talked about the struggles for LGBT and immigrant rights. He emphasized the role of the labor movement in championing movements that expand democracy and protect hard-won rights in the workplace, like domestic partner benefits. Members of CWA, the Service Employees International Union (SEIU), the Coalition of Black Trade Unionists (CBTU), the Operating Engineers’ International Union (IUOE), the United Auto-Workers’ Union (UAW), Jobs with Justice (JWJ), the Missouri Immigrant and Refugee Advocates (MIRA) Coalition, Young Activists United-St. Louis (YSTL), the Missouri Progressive Vote Coalition, and the Laborers’ International Union, among many, many other organizations attended the Breakfast, which is held the Saturday closest to May Day, the International Workers’ Holiday.